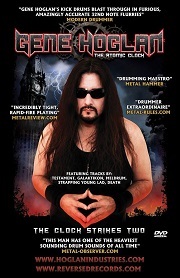 Gene Hoglan, this monster of a drummer who needs very little introduction, has just released his second demonstrational and instructional DVD titled “The Atomic Clock: The Clock Strikes Two,” and as you would imagine it’s a real treat for fans and an overall feast for the eyes and ears. Hoglan leaves the impression of a great virtuoso very easily, as his remarkable abilities on the kit are stupidly exquisite and at least for me, it’s always interesting to listen to musicians self-reflect on their work and techniques. Gene has an easy going, easy-to-listen-to kind of style of presentation and seems like a very nice dude altogether. Spanning over almost two hours, “The Atomic Clock: The Clock Strikes Two” lets us get a sneak -peak into his array of insights working with world standing artists on some extremely important and timeless releases. The DVD is filmed with 12 high definition cameras, offering segments of Gene playing, either full songs or specific parts he sees important as highlighting. In between those, Gene is sitting calmly, explaining and accompanying the viewers with great charm and enthusiasm. Going through the years working with cannons like DEATH, FEAR FACTORY, STRAPPING YOUNG LAD, and most recently TESTAMENT, Hoglan has deservingly earned his reputation as one of the talented and influential Metal drummers of all time. His trademark style of unbelievable preciseness and finesse has been tried to be imitated on countless acts by countless drummers. The DVD was shot at The Warehouse Studios (Vancouvver, Canada) giving a great one on one feel, but more in the style of a very warm conversation between friends rather than a technical or dry drumming lesson, as it very easily could have been. On the contrary, it seems very intentional that the presentation and segments themselves are very easy to get into and this should be enjoyable to every music enthusiast, rather than only drummers or metal heads. Featuring interviews with characters like Scott Ian and Frank Bello of ANTHRAX, THREE INCHES OF BLOOD/REVOCATION’s Ash Pearson, Jason Bittner of SHADOWS FALL, Chuck Billy, Alex Skolnick, and Eric Peterson of TESTAMENT, and having Gene perform tracks like TESTAMENT’s “Rise Up” and “Native Blood,” GALAKTICON’s “On My Way,” SYL's “Skeksis,” “The Philosopher” and “Overactive Imagination” by DEATH, and more, this release is an abundance of extreme talent and musical goodies. I recommend this to everyone.